An intense, deep grey, crossed by mesh-works of pale yet bold vein patterns that lend a glossy sheen to their surroundings. Grigio Intenso is a large-size marble-effect slab, available in the lappato lucido finish with a thickness of 12 mm. Its characteristics make it the ideal material for cladding all sorts of surfaces: worktops, backsplashes, tables and kitchen islands, bathroom vanity tops and bar and restaurant counters. 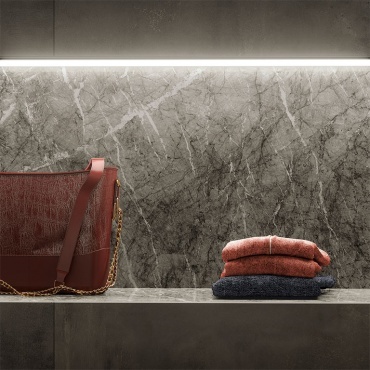 Habitat Grigio Intenso: the Grigio Intenso lappato lux marble-effect slab has been combined with several design items, original details and Atlas Concorde products. Boost Smoke in the wall tiles, Heartwood Moka in the floor tiles and, for the display blocks, 3 products from the Marvel Dream line were selected (Black Atlantis, Crystal Beauty, Brazil Green).